Large solar installations are available for businesses, schools and farms, helping to cut electricity bills by thousands of pounds every year and earning an income with Government incentives. Large organisations spend a lot more annually on electricity bills, which is why these bigger installations have been specifically designed to help cut that expense. Unlike solar panels for your home, these large scale solar installations come with dozens of panels. They are normally positioned on the roof or ground, facing south or southwest. This ensures they receive daylight at all times throughout the year and generate more electricity. Solar panels work by creating an electrical charge. Two layers of semiconducting material collect the sun’s natural rays and convert the energy into usable electric for lighting and appliances. The solar panels are connected to the National Grid ensuring a fixed income and other fantastic benefits. Electricity rates are increasing year-in year-out and many people are looking at solar panels as the most viable way to help them cut their spending and earn a fixed income. Cut your electricity bills by thousands of pounds every year by utilising a natural, environmentally friendly form of energy. A solar panels installation will be even more effective for schools and businesses because they’re used most often throughout the day – saving even more on bills. Make a profitable return of investment with the Government’s feed-in tariff, which was first launched in 2010. 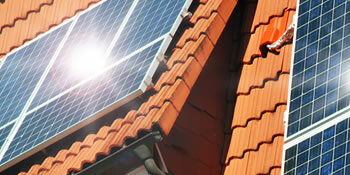 It offers those who take up solar a guaranteed payment for 20 years. Any excess electricity can be sold to the National Grid, ensuring that every unit of energy you generate is used in some way. Reduce carbon emissions your school, farm or business creates. This will make your organisation more environmentally friendly and also help the Government meet EU targets. Project: Looking to have solar panels on my next commercial building. It will be serving 20 offices and a communal space. Project: new apartment block to be built start of next year, flat roof, total space 686 sqm. Aim: to provide electricity for 24 x 4kW heat pumps, providing a total of 54MWh electricity/year. Cordel was very knowledgable and was not pushy in any way. He was very open and honest and was a pleasure to deal with. Simple, effective and I wasn't bombarded with nuisance calls. Very good telephone manner, listened carefully to our unusual situation.